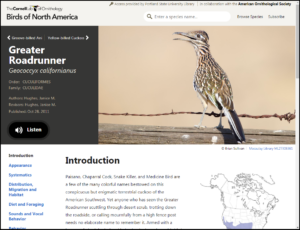 The latest featured resource at PSU Library is the database Birds of North America. Birds of North America has information about over 760 bird species that breed in the United States (including Alaska and Hawaii) and Canada. In this database, ornithologists and other bird experts write detailed accounts about different bird species. Accounts include summary information, as well as in-depth, authoritative research. Sounds, images, video, and maps give even more information for researchers’ varied needs. Birds of North America is for everyone. Users can browse the database easily for a basic overview. On the other hand, researchers who need more in-depth research about specific species information will be able to delve into more details. Information includes a brief introduction about the bird, as well as detailed information including migration, diet, behavior, and conservation. PSU Library’s subject guides are designed to help PSU researchers learn more about topics and classes at Portland State. The Biology subject guide includes other useful resources beyond Birds of North America, as well as information about finding books and articles, citing sources, and other research help. Other subject guides include topics like Environmental Science and Management and Sustainability. Use the Library catalog to find print publications around the library, as well as links to full-text documents available 24/7 online.